The Grand Challenges-Focused Research Experiences for Teachers (RET) with Stratified Teaming Program concentrates on both implementing and examining stratified teaming. 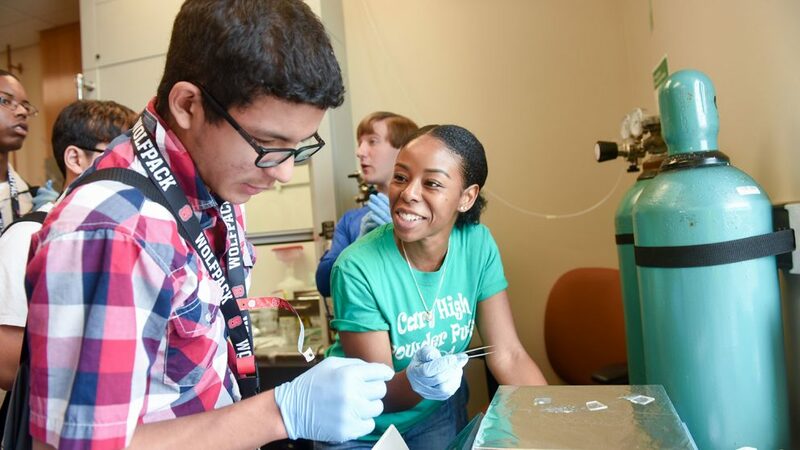 A team consisting of a K-12 teacher, a community college STEM faculty member, a pre-service teacher and an engineering undergraduate student will undergo a shared experience in the lab of a partnering engineering faculty member. 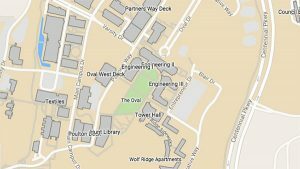 Both the College of Engineering at NC State University and the University of North Carolina at Charlotte (UNCC) will serve as host institutions. Durham and Charlotte-Mecklenburg County Public Schools will work together to recruit partner teachers for the RET experience. The colleges of Education at NC State and UNCC will help recruit pre-service teachers. The idea for this teaming approach grew out of experience with the graduate students in a K-12 program sponsored by NSF, through which NC State and UNCC were both funded. Local industry, including SAS Institute, will serve as both partners and participants in the project. The site will place teams in partner labs focused on one of four sub areas of the Grand Challenges for Engineering: sustainability (solar energy), health (biomechanics), security (computer network security), and joy of living (aerospace engineering). 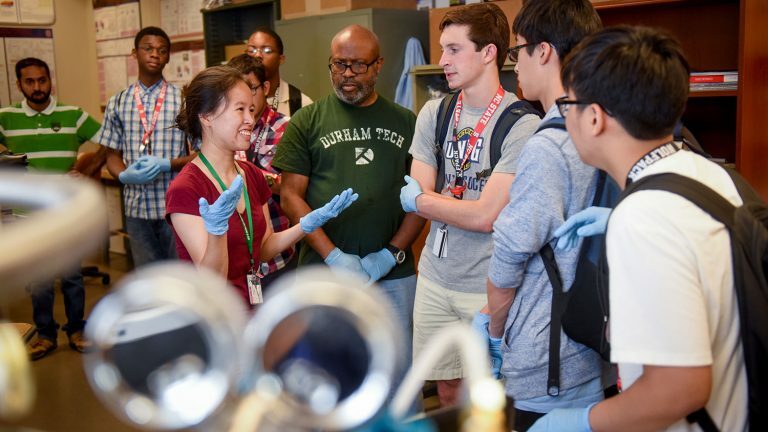 The teams will spend mid-June through July on site at each of the universities, concluding with an overall summit at NC State to which other RET sites will be invited to send their teachers. High school students with visual impairments or blindness attended a 2016 summer camp at NC State's Engineering Place. Their activities included lab tours with participants from the College of Engineering's Research Experiences for Teachers Program. Previous research on teaming for undergraduate engineering students, graduate students and teachers has shown dichotomous effects for each participant. In addition to the traditional products of an RET site, which include classroom activities and techniques linked to cutting edge research that can be taken to the K-12 classroom, this RET will also inform the body of knowledge concerning partnerships between K-12 schools and universities. The project research will enumerate the types and depth of effects on each of the six different constituents of the teams: K-12 teachers, pre-service teachers, community college faculty, undergraduate engineering students, graduate students in engineering and university faculty. The project will have impact beyond its own reach in several ways. The information gathered from the research questions will be applicable to other RET sites around the nation. The end of the summer curriculum exchange conference will serve as a platform for the participants to share knowledge among themselves and with teachers from RET sites across the country. The design of both the project staff development and the curriculum exchange will include aspects of teaching underrepresented students through challenge-based learning, including students with disabilities as well as girls and underrepresented ethnicities. Create positive benefits for each participant (increased STEM efficacy for teachers, improved classroom technique for both teachers and faculty members, increased engineering efficacy for undergraduate engineering students and enhanced retention). Research the impact of participation in the RET on each participant as they return to their native environment. Discover elements of stratified team design that are most efficacious in meeting the above goals to inform the design of future RET programs. 1. How does the construct of the RET teams affect the “desired outcomes” for the participants? 2. How does the construct of the RET teams affect the quality of curriculum generated? Engineering and education professionals will assess activities developed by the participants at the end of each summer. These activities will also be implemented in the classroom during the school year, and the teachers will complete a self-evaluation and reflection about the activities. The Grand Challenges-Focused RET with Stratified Teaming Program is supported by the National Science Foundation under Grant No. EEC-1542377.